Over twenty million years ago, when the dinosaurs still roamed the Earth, the orchid sprang to life across the continents; this resillient flower can thrive across the world and has adapted to most conditions, yet still retained its beauty. For flower enthusiasts, we've listed some orchid care tips to help keep your plant thriving. On the top of our orchid care tips is probably the simplest question, but you'd be surprised how often people mistakenly water their orchids. Because most orchids thrive in rainforest conditions, many make the mistake of watering them frequently to reproduce rainforest weather - unfortunately, too much water can kill the root of the orchid in no time. For orchids grown in the home, water every 5 to 12 days. More frequent watering is required for summer months. Some orchids may require little watering, so you should find out what type of orchid plant you have and use the correct amount for your orchid species. How often should I fertilize my orchids? 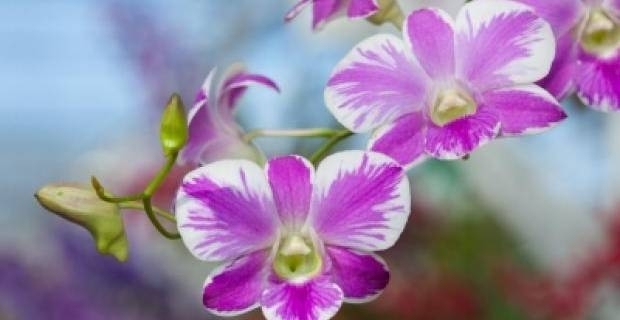 You should only use an orchid food supplement formulated for your particular breed of orchid and should, in the first instance, follow the instructions on the packaging carefully. Frequent fertilizing may burn roots and inhibit flowering. For most brands and orchid species, it's recommended to fertilize once a month. Are my orchids getting the right amount of light? Check the leaf colour of your orchids. Leaves should be bright green, rather than dark green; dark green indicates too little light, whereas reddish hues indicate too much light. For orchids requiring high intensity light, place them in a South or West facing window but protect the plants from the heat of midday sun by lowering blinds in the day. One of our top orchid care tips is repotting advice. Many make the mistake of repotting their plants too soon, but most orchids don't need to be repotted for up to two years. When repotting, remove all dead roots and debris. Don't resume regular watering until a week after repoting the orchid to allow it to adjust.